I think its fair to say. Most people had doubts about Rally Turkey. Partly because it was a brand new event in a brand new location. Partly because of the past political unrest & news stories over the past few years. Understandably, people were cautious of the event. But all of that was quickly forgotten about when the action got underway. Rally Turkey turned out to be the classic gravel event, similar to the Acropolis or Cyprus rallies that the WRC has been missing for far too long. The organisers did a truly outstanding job to put back the Challenge into the WRC. Looking at the reaction on social media, it was a much loved event, with only a few, questioning if the event was too tough. The fact is, the World Rally Championships has always been a test of ‘man & machine versus the elements’. That’s the WRC slogan that has perhaps been a little bit forgotten over recent years. One thing that hasn’t been questionable or forgotten, was the stunning performance of Ott Tanak. As if winning on gravel in Finland, then the tarmac of Germany wasn’t enough to convince us of his ‘all rounder’ ability. He wins on an event that is all about risk assessment, judge of pace and mechanical sympathy. The Estonian judged it to perfection to take his 3rd win in a row and jump to 2nd in the title fight. Tanak was one of only 5 WRC cars to actually make it to the finish without retirement. 6th place was taken by the brilliant Henning Solberg in a smaller and less powerful R5 car. So how did this happen? The drama got underway on Friday morning, before the drivers even made it to breakfast. The fire alarm of the Hyundai hotel woke up the team for an early morning evacuation. The first full day was expected to be the roughest day. The stages weren’t really roads, more like a rock pile dumping ground. Ogier struggled to see anything in lingering dust, while team mate Evans had intercom problems. Citroen’s Craig Breen took the lead from Mikkelsen who led after Thursday nights super special. Into the following stages, Evans day got worst with a broken Diff, leaving a trail of oil on the stop line. He had to use his mechanical skills to avoid retirement. Mikkelsen retook the lead going into service. In the afternoon, Breen’s brilliant morning turned south with a puncture, as did Mads Ostberg, dropping both Citroen’s down the leader board after great pace at the start. Evans day went from bad to worst, hitting a rock and breaking his suspension. He was then followed by Ostberg, who came to the same fate just 1km further down the stage. It was the end of the road for them as rally Turkey began to claim it’s victims. Remarkably, by the end of the day, despite the running order, it was Neuville who led the rally with Ogier close behind him by an incredible three tenths of a second – But that was all about to change. Saturday was expected to be smoother. Not that you would have noticed. Neuville charged hard on the first stage of the morning. 8 seconds up on Ogier on the split times. Maybe it was too hard, his front left suspension mount couldn’t withstand the Turkey rubble any longer, and his spring had sprung, along with his title hopes. He tried his very best to repair the limping Hyundai but it was no good. The Championship leader was out of the rally. His title rival reacted immediately and went 22 seconds faster than anyone. Ogier was on a high while Neuville could only sit back in service and watch his championship hopes fade away. But the turkey rubble hadn’t finished with our WRC drivers just yet! Neuville, watching the fabulous WRC All Live coverage, couldn’t believe his eyes when he saw Sebastien Ogier’s car also falling apart on the following stage. The front right wishbone had given way and now it was the Frenchman’s turn to become a mechanic. The world watched, as the WRC all live feed fed us footage of a dirty, sweaty Ogier doing his very best to fix the problem. The team on the phone, fellow team mates Evans, along with other fellow drivers by his side trying to give him advice. But the stubborn replacement suspension arm just wouldn’t go into place. Until, eventually his mechanical skills – along with a ratchet strap and a good beating, got the car, just about in working order to tackle the next stage, taking time penalties for being late with that frantic repair. The world was on the edge of their seat, as a now fired up, frustrated World champ Wrestled the botched Fiesta through the final stage of the morning who, unbelievably set yet another fastest time. The dirt and sweat on Ogier’s face at stage end said it all. “I thought I would never make it. We tried to put the track control arm back but the suspension wishbone was too tight in the sub-frame and I couldn’t fit it in. I fought like hell and was very close to giving up because I had no energy,” said Ogier. That was hard work. Even Ex-WRC driver Kris Meeke sent Seb O a tweet, expressing his support for the road side repair, reminding him of the time when Colin McRae once had similar issues and sharing some video footage of his old mentor from Rally Argentina in 1998. Saturday was more about engineering than driving pace. Luckily for Ogier it was now time for service. But that didn’t mean M-Sport could relax. With only 30mins to get the car back to perfect running order, M-Sport had to take some mechanics off Evans car to help put the number 1 Fiesta back together again. This left, Evans’s car short of hands and with big repairs. Resulting in both Elfyn Evans and Co-driver Dan Barritt having to get on their hands and knees to service their own car. You won’t see Lewis Hamilton getting his polished nails dirty like that in Formula one. Take a quick breath. Now it’s time to go back out into the battle field for the afternoon. The Frenchman with his car all fixed, blasted into the stage. But after all that hard work and effort by Ogier and M-Sport. It all slid to a grinding halt in a slow left hand corner. Ogier slid wide towards the edge of the road into some very loose dust. Almost like the ‘Fesh Fesh’ that you would find on the Dakar Rally. The Fiesta came to a stand still against a tree. No damage. He selected 1st gear. Foot down, but the car just buried it’s feet. The car was stuck. With no fans around to help, that became the simple but agonising end to Sebastien Ogier & Julian Ingrassia’s Rally. Along with any hopes of closing the gap to title leader Neuville in the Drivers Championship. Elsewhere rally leader Mikkelsen dropped down the board with transmission problems, leaving him with just rear wheel drive and spins a plenty. Craig Breen had smoke filling up his car. He had to stop his Citroen twice on the stage, a quick search but no fire could be found. They struggled on to the finish with stinging eyes and tough breathing. Then when stopped on the road section to investigate further, the car caught fire. Breen an Co-driver Scott Martin ended their day with a pile of ash which was once a Citroen C3 WRC car. All that drama left the two Toyota boys leading the way. Tanak just 13 seconds ahead of team mate Jari-Matti Latvala. Understandably, they were given team orders to hold positions and to drive safely through Sundays stages to the finish. Ott Tanak survived the worst of conditions to finish on top. He now puts himself well a truly in the Title fight. His win puts him 2nd in the drivers standings. 10 points ahead of Ogier & just 13 behind Thierry Neuville who still holds the lead. Tanak’s victory on the podium was greeted by the president of Turkey, along with an army of security personnel and the FIA president Jean Todt. Latvala was the perfect team player to finish 2nd making it a Toyota 1 – 2. Hayden Paddon stuck to his very mature strategy of driving to a safe pace. Which paid off and claimed his first podium of the year. M-Sport’s star Teemu Suninen finish a brilliant 4th place. The youngster being the highest placed Fiesta driver with Mikkelsen eventually managing 5th after his problems. In 6th place was R5 Skoda driver Henning Solberg. A brilliant result for the returning Norwegian. In WRC2, Skoda driver Jan Kopecky fought his way back after a tough rally to retake the lead on Sunday and claim his 5th win, to put himself within touching distance of the WRC2 title. Simone Tempestini brought his Citroen C3 R5 to 2nd place. Finishing in 3rd, after leading the rally before a puncture dropped him down to the bottom step of the podium. Brit Chris Ingram impressed massively on his WRC2 debut on what is now arguably the toughest rally on the calendar. All eyes will be on him when he returns on Wales Rally GB. 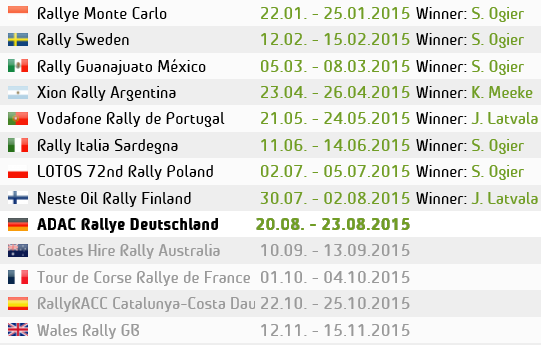 The WRC title battle is getting tighter with just 3 rounds remaining. Next up is the valleys and mud of Wales Rally GB. WRC Drivers’ Standings – 1. Neuville 177pts, 2. Tänak 164pts, 3. Ogier 154pts, 4. Lappi 88pts, 5. Latvala 75pts 6. Mikkelsen 75pts.